At least one person has been seriously hurt in a crash between a car and a minibus at Loch Lomond. 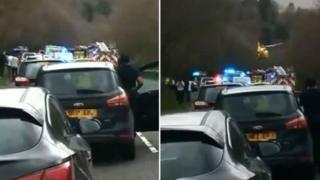 Traffic came to a standstill as police and emergency services, including an air ambulance, were called to the A82 near Aldochlay, south of Luss, at about 14:50 on Friday. The BBC understands that one person has been seriously injured. The Scottish Ambulance Service said a trauma team had been sent to the scene. A Scottish Ambulance Service spokesperson said: "We received a call at 14:49 today to attend a road traffic incident on the A82 near Aldochlay. "Two ambulances, a paramedic response unit, our trauma team and an air ambulance have been dispatched and our crews are still currently working on scene." A stretch of road has been closed between Luss and Aldochlay, according to Traffic Scotland. Diversions will be put in place and it is thought the road may be closed for some time.